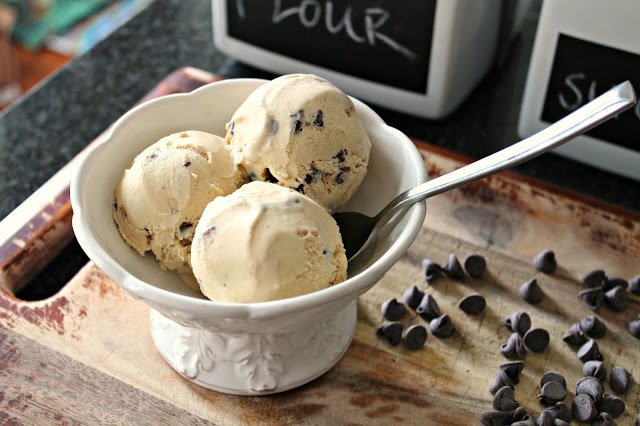 Chocolate Chip Cookie Dough Ice Cream – A chocolate chip cookie dough ice cream that tastes like cookie dough in every bite. Well, hello there. It’s been quite a long time. Where have I been, you ask? Long story short, I got lazy and let life get in the way of my blogging. But my baking and love of food never ceased. And now my passion for blogging has resurfaced. So….here I am! Back at it for your reading pleasure. We moved into our first house! You’ll probably see pictures of my favorite room in the house, the kitchen. I’m obsessed with it! Now that you’re all caught up, let’s get down to business. 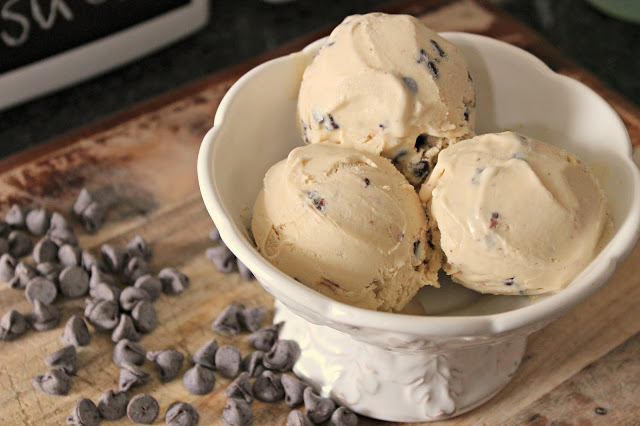 This week’s recipe is an ambitious one: chocolate chip cookie dough ice cream! I think this goes without saying, but I will anyway: you will need an ice cream machine for this recipe. Doesn’t matter what kind, though. 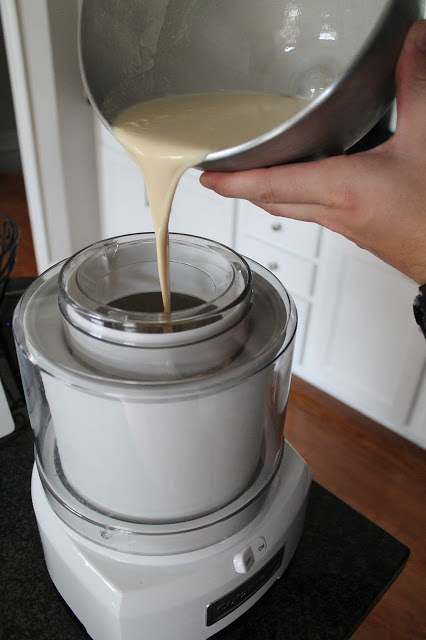 I have a very basic model from Cuisinart (less than $100) and it makes perfect ice cream. So no need to get those fancy machines that are like $200 or more. Unless that’s what you really want. But definitely not necessary. Let me start off by saying, I have been OBSESSED with my ice cream maker the last few months. It was a wedding gift I received but only just started using it regularly. I think it’s because I have a lot more space in my new kitchen so it’s less of a hassle to get the machine out. Whatever the reason, I am just so happy with it. I’ve made a few different ice creams and a handful of sorbets. So easy! When I was looking for a new flavor to make, I asked Tyson what ice cream he wanted next. And his request was chocolate chip cookie dough ice cream. Of course it was. Since you don’t know my husband, let me explain. We have tried cookie dough ice creams made by almost every brand. I guess you could say it’s been our search for the best one. It’s also one of his go-to flavors when we go to an ice cream shop, whenever he’s not getting vanilla. So I was not surprised when this is what he asked for. At first, I was a little concerned. 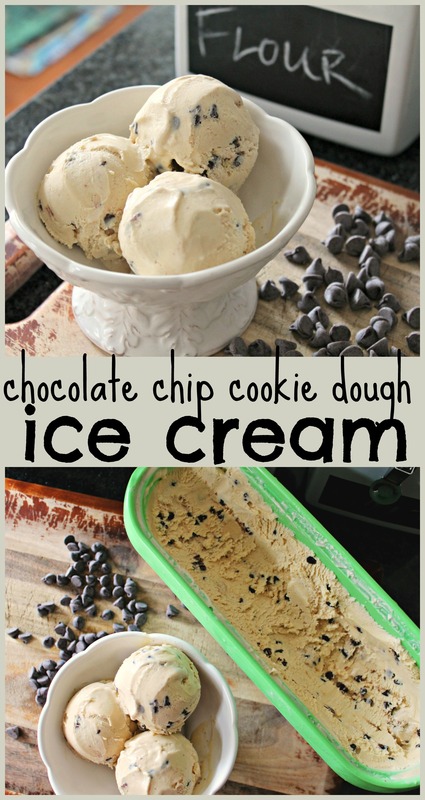 Chocolate chip cookie dough sounds so complicated! There are so many components to making that flavor. But after researching, I realized it’s actually not that bad. You just make the same ice cream base, but with brown sugar instead of granulated sugar, add chocolate chips, and make little cookie dough balls that you mix throughout. Ok, making the cookie dough balls still scared me a little. But I decided to woman up and take on the challenge. That’s what so much of this blog is about! I’ve never backed down from a challenge before, and I wasn’t going to now. So without further ado, let’s get started! Mmmm cookie dough. Ain’t nothin’ like it, my friends. Alright, now let’s talk about the recipe. What drew me to this recipe was how it claimed that the ice cream itself tasted like chocolate chip cookie dough, even without cookie dough bits. That was so important to me. Personally, I don’t think chocolate chip cookie dough ice cream should taste like vanilla with cookie dough bits. So when I read this, I knew this blogger was my kinda lady. Another thing that I liked about this recipe was that it was a custard-based ice cream. You can tell by the fact that it uses egg yolks and heats them up with milk to make them thick. The only ice creams I’ve made are custard-based. I prefer these because it gives the ice cream a silky, creamy texture from all the fat in the yolks and heavy cream. I’m too nervous to use anything with less fat, as I don’t know if the consistency will be what I’m looking for. In other words, I’m worried that it will yield an icy-tasting ice cream. Obviously, it’s possible to make amazing, creamy ice cream with just milk (that’s how gelato is made). But you need more advanced machinery to handle those consistencies. That’s when those fancy $200+ machines come in handy. Until I get one of those machines, the ice creams I make will be some of the most unhealthy that one can make. But that’s the risk I must take for the sake of quality!! 1. 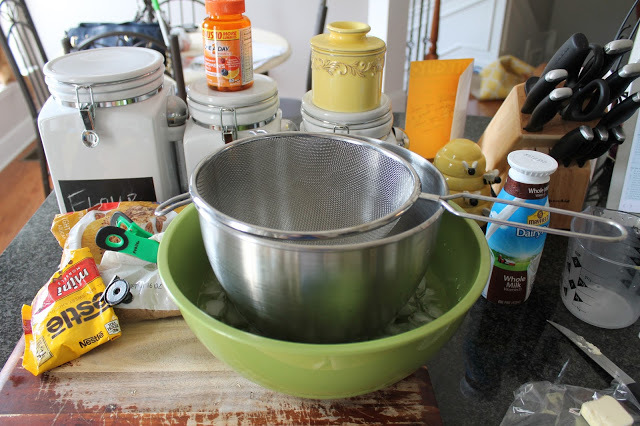 Start off by placing a metal mixing bowl inside a larger mixing bowl. Place a strainer on top of the metal bowl. 2. Place very cold ice water in the large mixing bowl until it reaches about 1/3 up the metal bowl. 3. Add heavy cream and vanilla to the metal bowl so that it gets chilled in the bowl while we make the custard. 5. Add the milk to the butter and bring just to a simmer. Remove from heat. 6. While you’re waiting for the milk to simmer, whisk brown sugar, egg yolks, and salt until creamy. Do not over beat. You don’t want to add too much air to the mix. It will make the custard foamy. 7. Slowly pour 1/2 cup of the warm milk into the egg mixture, whisking while you pour (this will slowly bring up the temperature of the eggs). DO NOT ADD THEM QUICKLY! I apologize for shouting but this is super important, okay?! If you add them fast, the eggs will curdle like scrambled eggs. 8. Pour the egg yolks and milk mixture back into the saucepan with the rest of the warm milk. Heat on medium low, stirring often, until the mixture slightly thickens and reaches 170 degrees or until it coats the back of a spoon. Do not heat it too fast or for too long! This is the mistake I made during my first attempt. It curdled the eggs so bad beyond repair. I highly recommend having a food thermometer to help you during this step. 7. Once the custard is complete, let it cool down slightly for a couple minutes. 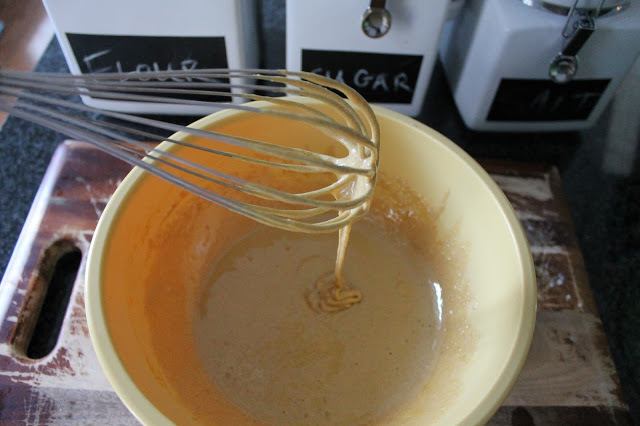 Then, pour it through the strainer and into the heavy cream and vanilla mixture. 8. Stir together until the temperature comes down. Place plastic wrap on top of the mixture to prevent a film from forming. Chill in the fridge for about 6-8 hours until very cold. While this is chilling, you should make the cookie dough. See instructions below. 9. Once the mixture is thoroughly chilled, pour mixture into ice cream machine. Prepare ice cream according to manufacturer directions. 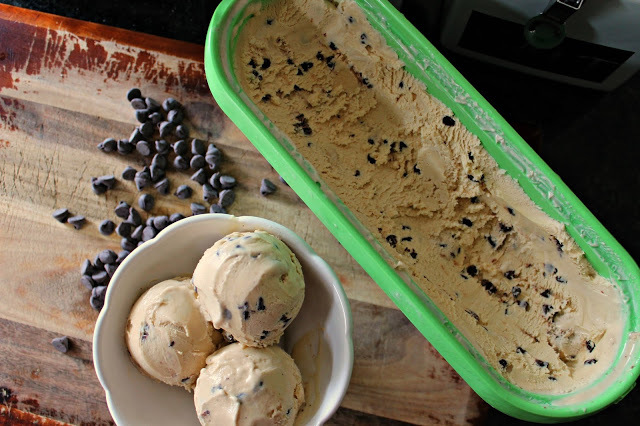 While the ice cream is churning, you can roll the cookie dough into little balls. Chill until it’s time to assemble. 10. About 5 minutes before the mixture is complete, add the chocolate chips. 11. When the ice cream is complete, it’s time to add the chocolate chip cookie dough bits (prepare them according to instructions below). Add some bits to the bottom of your freezer-safe storage container. Then add about 1/4 of the ice cream. Add another layer of the cookie dough bits and continue layering until complete. 12. Place plastic wrap on top of the ice cream to prevent frost from forming. Cover the ice cream and freeze until hard (about 8 hours). 1. Beat butter and sugars for several minutes. Beat in milk and vanilla extract. Add the flour and salt and mix until combined. Stir in chocolate chips. 2. Place the cookie dough in the fridge while the ice cream base chills. This will allow the dough to firm up slightly. 3. Once firm, you can roll into little balls. I suggest doing this while the ice cream is in the machine, since you’ll have some time to kill as it churns. 4. Once you’re done rolling into balls, place in the fridge until ready to assemble. See step 11 for assembly instructions.